Mad. New York: E.C. Publishing, December 2010. Print. 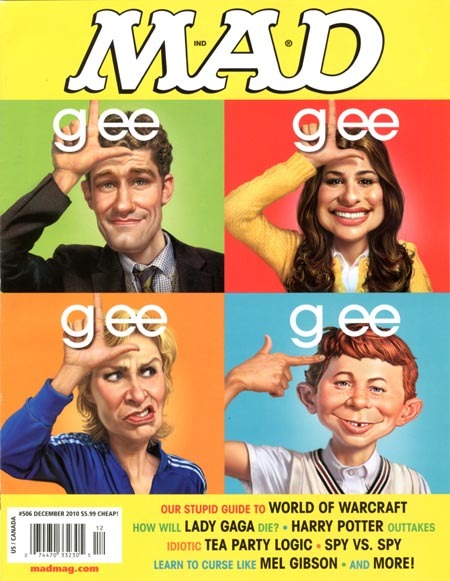 Mad magazine’s silly and juvenile sense of humor appeals particularly to boys from 6th to 9th grade. It started out as a comic book in 1952 and has evolved over the years to include not only the magazine, but a TV show/network, various graphic novels and books, and even a board game. I feel that the magazine is over the top and barely funny, but I think that’s the point. Grown ups aren’t supposed to like it. Mad has always had a reputation for pushing the envelope. The magazine is full of cartoons depicting pop culture and current events. The overall tone of sarcasm and the fact that about 85-90% of the magazine is dedicated to making fun of celebrities may appeal to tweens who are not interestedin educational or fashion magazines. One thing I like about the magazine is that there are no advertisements. The only advertisements in the issues I looked at were on the back cover. 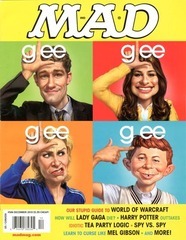 The advertisements inside of the magazine are geared towards Mad merchandise and television show. The other ads inside the magazine are all of Mad’s generic advertisements. In the December issue these ads included one for the Mel Gibson Domestic Abuse version of Rosetta Stone, a Silly Bandz condom advertisement (so inappropriate), and one for Dead Lobster, which invites customers to “come celebrate our Gulf disaster deals”! Seeing as how tweens are constantly bombarded by marketing and advertising, this must be a nice respite from some of the other magazines. Some learning activities that could be derived from the magazine are “Current Events Mad Style” and “Comic Madness”. In “Current Events Mad Style” students would choose a newspaper or internet news article and rewrite it using the influences of the magazine. Making it sarcastic, silly, or even making fun of the people the article focuses on. Students would be encouraged to report both versions of the article and students could give feedback as to how it could be more ‘mad’. This could also be a group project. The activity “Comic Madness” would involve teachers or librarians sharing a story or a lesson and then encouraging students to draw their reactions in a comic strip, a generic advertisement, or a fold-in (a regular feature in Mad Magazine that depicts a scene and wording but is then folded in a certain way to show a completely different scene). Okay, this one isn't always the easiest sell with limited budgets for magazine subscriptions, but it needs to be included. This is a magazine that will be read by boys who probably wouldn't be caught dead reading anything else for fun. As well as boys who want to be entertained and grossed out. It's appeal is the same as Captain Underpants, and even Diary of a Wimpy Kid. The magazine has staying power, having been in publication since 1952, and despite all the changes between then and now, it seems that the taste of tween boys hasn't evolved all that much.